Fun game with simple rules. 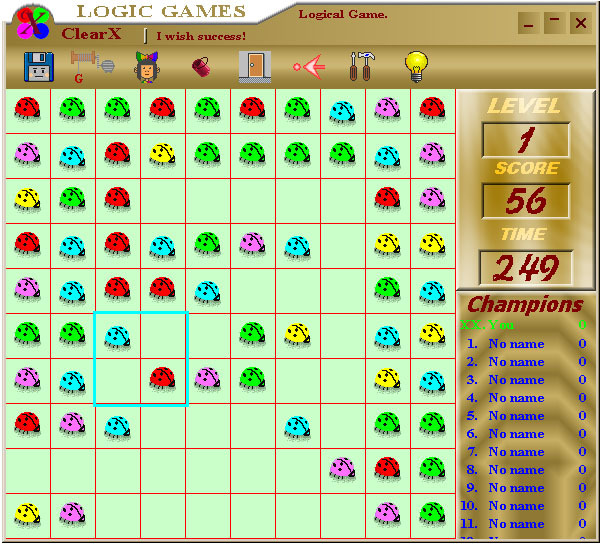 The aim of the game is the clearing of a field of multi-coloured blocks, placed on it. The clearing is carried out by motion of four blocks, selected by a framework, so that in one or several directions, (line, column or diagonal) has become five or more blocks of one colour. In this case line, column, diagonal or all together will disappear. Fun game with simple rules. Move and combine units to win. You should make clearing of a field for the time, fixed for a level. The number of levels is unlimited. On our site you can download "COLLECTIONS" of games. Their registration is made for all games of collection simultaneously and costs cheaper - up to 4 dollars for game. Qweas is providing links to ClearX 2.48 as a courtesy, and makes no representations regarding ClearX or any other applications or any information related thereto. Any questions, complaints or claims regarding this application ClearX 2.48 must be directed to the appropriate software vendor. You may click the publisher link of ClearX on the top of this page to get more details about the vendor.